It's a bit late for me to recommend fabulous stuff for Father's Day at this stage considering it was over a week ago - but Father's Day is not the only day in the year we get to show our men-folk some love - so I'm going to show you what I ordered from Zazzle for the two Dads in my life anyway. I sometimes find it difficult to buy for both my Dad and my other half. Neither of them have 'typical' interests. Neither golf, nor follow football or rugby... or any sports really. Neither are big drinkers and neither wear a tie to work. So when it comes to Father's Day... there's usually not a lot left to choose from! Here's where gift-sites like Zazzle really come into their own. With thousands of cool products on offer I always know I'll definitely find something suitable. Besides finding fantastic gifts for the golf-playing/football-watching/beer-drinking/tie-wearing type Dads out there you're always guaranteed to find something a little more quirky that suits the more... oddball individual... Dads. My Dad and my other half are very different in their personalities. One is quiet and shy, the other gregarious and talkative. They have one thing in common though, and that's an interest in guitars. Playing them, collecting them, spending hours on the internet looking at them, talking together at length about them... Guitars is where it's at for these guys. Now, as much as Father's Day is a day to show them how much they are loved and appreciated -it's not really a day that warrants splashing out on a new guitar for each of them. (I doubt they'd agree with that statement!) So, I went for the much more affordable option this year - guitar picks. 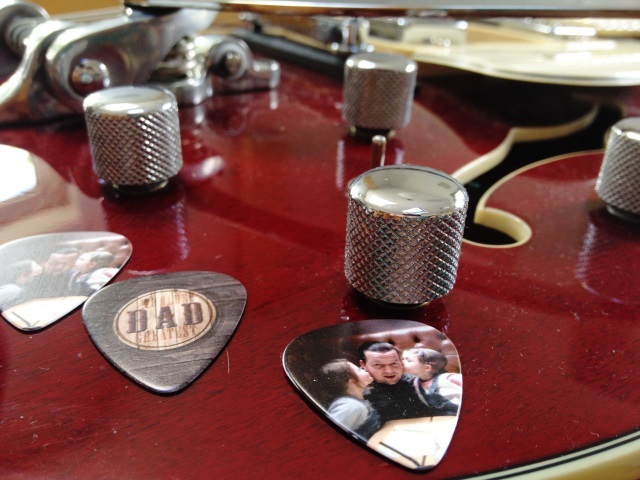 But not just any guitar pics - CUSTOMISED guitar picks - and they were a huge hit. The only difficult part of customising these plectrums on Zazzle was choosing the designs, It's literally impossible. There are so many cool styles to choose from. In the end I went with the two designs recommended in the 'For Dads' section of the site which actually suited very well. The one I chose for the girls to give Devo has 'World's Greatest Dad' on one side and I customised it by adding a photo of him with our girls on the other side. I got 'Daideo's Plectrum' (Daideo is Irish for Grandad) printed on the ones for my Dad and let the girls get the praise for choosing such a thoughtful gift. The image on that one was an antique map. I have a bit of a thing for maps so it caught my eye. The quality and print is very good. The guitar-expert-dads say, that "they are a great mid-weight pick" with good grip and just enough flexibility. After continual use since Father's Day there is no visible wear tear to the pick or the image. In that case, if you can manage to keep them from being stolen by small children, they should last quite a while! If you've got a birthday, an anniversary or any other special occasion to buy for Zazzle is bound to have something perfect for you. Click HERE to start shopping! To see more cool Zazzle products we have reviewed - click HERE - and stay tuned for even more Zazzle fun over the next few weeks. 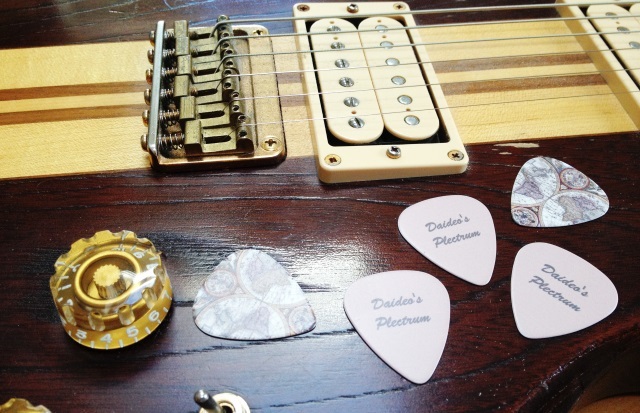 Diclosure: Zazzle provided two sets of personalised plectrums free of charge for the purposes of review. All opinions are my own and those of family and we were not paid to give them.